Long Live the Penny Red! When the Penny Black was introduced, Rowland Hill offered the public a choice between the stamp and postal stationery named after its illustrator, William Mulready. 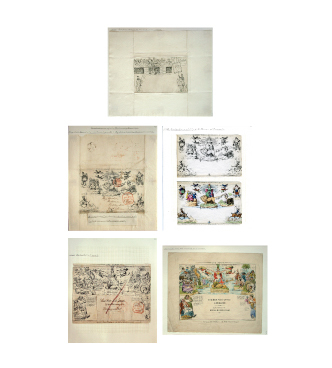 Mulreadys were pre-stamped lettersheets and envelopes with allegorical images of Britannia surrounded by figures representing various continents. Unfortunately, the stationery was not well received. It was satirized and widely caricatured. Although the allegorical images may seem amusing, much opposition to the Mulreadys came from stationers. They feared a loss of revenue because the Mulreadys competed with what they sold. Within a few months, the Mulreadys were taken off the market. Today, the Mulready caricatures that have gone through the mail are highly prized by collectors.